Can you use a Marine Descaler on an aluminum outboard engine? We recommend a Hammerhead Marine Descaler Flush every 100 hours, or twice a year for any engine running in warm, calcium rich waters. This is a revolutionary change to outboard marine engine maintenance which has come about through Bright Bay’s next generation chemistry. Only Hammerhead Marine Descaler is made with aluminum safe cleaning agents designed for today’s high performance marine engines. Now you can even descale your aluminum outboard engine safely! The attached pictures were taken of a 4 stroke outboard engine in Key West. The block cracked with less than 200 hours because marine scale had restricted water flow for engine cooling. Because water flow and scale buildup are a maintenance item, damage was not covered under the manufacturer’s warranty on the $20,000 motor. A marine descaler would have prevented this damage. When compared to other brands such as Rydlyme Descaler and Barnacle Buster, we found Hammerhead Marine Descaler to be as effective, less expensive and safe for use on aluminum outboards. Owners have historically only used “salt away” to flush outboard engines because acid descalers are not safe for the aluminum heads. 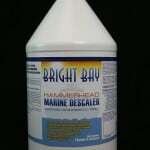 Salt away does not remove marine biogrowth which ultimately causes engines to overheat. The traditional repair method for an overheating engine is to tear down and rebuild. We are going to recommend that an outboard Hammerhead Flush be done with each oil change as a preventative maintenance procedure for avoiding marine scale buildup, overheating, and engine rebuilds. Watch this video of Hammer Hear Marine Descaler in action! This entry was posted in Boat Maintenance, Engine Maintenance, Marine Descaler and tagged barnacle buster, marine descaler, Rydlyme on February 7, 2012 by Jason Revie.